11am - 4pm Sat., & Sun. 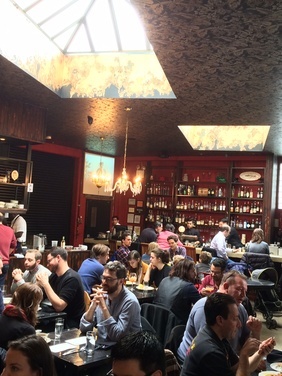 Chalk Point Kitchen takes its brunch seriously. That's also probably why it is so darn good. 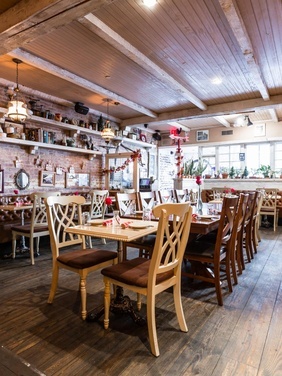 You'll have excellent food, great bloody Mary's and terrific service in a space that is hip, cozy and fun. Chalk Point has quickly evolved into a brunch hotspot. The name is a take on a part of Lower Manhattan that was once called Chalk Point by the Dutch. Inside you'll discover that attention has been paid to every detail-- the red and white checkered napkins, the nicknacks on the walls, papers that are hung by clothespins on a clothesline, decorated plateware, potted plants, and the wall at the entrance full of Polaroids of customers. The whitewashed walls and wooden country chairs give Chalk Point the feeling of an old farm, and the chef and owner make a point to use locally sourced ingredients. Arrive hungry and thirsty because the menu is huge. You'll want to order the Banana Croissant French Toast and one of the Benedicts-- there are five to choose from. They all come with Spinach and a Thomas' English Muffin. Benedict choices include the Market Avocado Benedict, the Kimchi Benedict, Prime Steak Benedict, the Peekytoe Crab Benedict and the Classic. For sides get the Grilled Watermelon and Thick Cut Applewood Smoked Bacon. There's also plenty of lunchie items available if that's your style. You must order one of the Bloody Marys. They come in Mason jars (which always makes drinking any beverage more fun), and are stacked with garnish. Order the Bloody Marty McFly made with a homemade concoction that includes BBQ Bitters and BBQ Rub. The Garnish includes a shrimp, blue cheese stuffed olive, tall celery stalk, and a crisp bacon strip. What's also nice about Chalk Point is there is a long list of juices to choose from including Carrot, Cucumber, Celery, Kale, Grapefruit and Pineapple, and four non-alcoholic cocktails like the Grapefruit Collins make with Grapefruit bitters. Brunch reservations are accepted for parties as small as 2 and are recommended. If you want standard bacon and eggs, go to a diner. If you want a sophisticated and unique meal in a cool setting, go to M.Wells. The brunch is a great experience, but the menu's not for everyone. Inside you'll dine in a large garage-meets-warehouse like space. It has a concrete floor and an industrial, airy atmosphere. The high ceiling is decorated in a funky gold and black wallpaper, and two big skylights sit in the middle of it. The large metal garage doors will be a nice touch when they open up fully in the summer. The M in M.Wells is short for Magasin, which means general store in French. Wells is a family name. M.Wells takes a chance with the menu and should be applauded for it. The only traditional brunch items are the caesar and wedge salads, skirt steak & eggs, and the M. Wells Madame (basically a croque madame.) But then the menu stretches further to include the Tripe, Tomato & Egg, the Foie Gras & Oats, and the Russian Waffle which is made with Cod, Crab, Creme Fraiche, Caviar, Dill and a Hard Boiled Egg atop a waffle. What you should at least order is the Papas Bravas with a Tomato Cheddar Sauce (ask for extra sauce), the Russian Waffle mentioned above, and the Full Breakfast. The Full Breakfast is loaded and comes with Kimchi, Pork Belly, Blood Sausage, Beans, Eggs, and a Hashbrown. The Crab Eggs Benedict is also a notable entree. M.Wells offer six very inventive cocktails. Try the Mirepoix Martini made with Hendrick's Gin, Carrot, Celery, and Onion Brine. It's surprisingly delicious. Or, opt for the Gold Russian with Rye, Kahlua, Ginger and Milk.